Bob Grant died after a two-year battle with cancer. He was born in Vancouver July 17/41 and died Feb. 22/17 in the Clearwater Hospital He and his wife moved to Clearwater from Nanaimo 25 years ago. He leaves his wife, Marilynne, who was his loving partner and best friend for 32 years. He has 2 daughters and 2 sons. Katherine Grant (Joe), Debbie Babuin (Steve), Chad Grant, Shawn Hetzler (Joanna). He has 4 grandchildren, Tessa Lighthart (Jerome), Selena Babuin, David Hetzler and Gabriel Hetzler. He has a brother, Royden Shurtz (Alene). For most of his career, he was a journeyman mechanic. He worked at various dealerships, on the lower mainland and then at the Slocan Mill in the mechanics shop. He also worked on the loader for a few years.He had his pilots’ license and loved the freedom of flying. He was a deeply spiritual man and studied the “Course in Miracles” for many years. He accepted everyone unconditionally. He helped others, especially when there was building involved. He could fix anything. He built a beautiful log home on 10 acres that he shared with his wife Marilynne. He loved living in Clearwater and he loved the neighbours. He has a sawmill which provided all the lumber to build a carport, storage shed, a shop, and a large shed to house all his equipment. He was a very creative man and had many talents. He was interested in electronics and built his own T.V. and speakers. He built his own computer and taught himself much about computers. Many thanks, to the doctors and nurses who were so compassionate and went out of their way to make Robert comfortable. I think one of his regrets (if he had any) may have been that he wanted to buy a Tessla car. He will be greatly missed by everyone. He touched many lives in many ways. 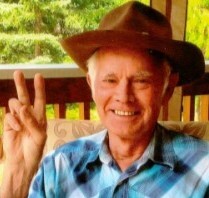 Funeral Arrangements entrusted to Drake Cremation and Funeral Services, Clearwater, BC. Kind and caring. When asked to describe Bob, these two words come to mind. I don’t think I’ve meet a kinder or more caring man. Our most sincere condolences to you Marilynne and all of the family. We spent many hours with you and Bob relative to Branch 250 activities and enjoyed his humor and compassion very much. We still recall the fun we had when we were all taking dance instruction at the Legion hall many years ago…you two were the best on the floor! His positive attitude and infectious smile will be greatly missed.